Over ten years ago (perhaps in 2004) my friend Michael Schwartz and his fiance Brandy showed me a game called 1000 Blank White Cards (which was originally developed in 1996). Players write pretty much whatever they want on the cards (sometimes while playing the game), and the winner is generally determined by whoever gets the most points. 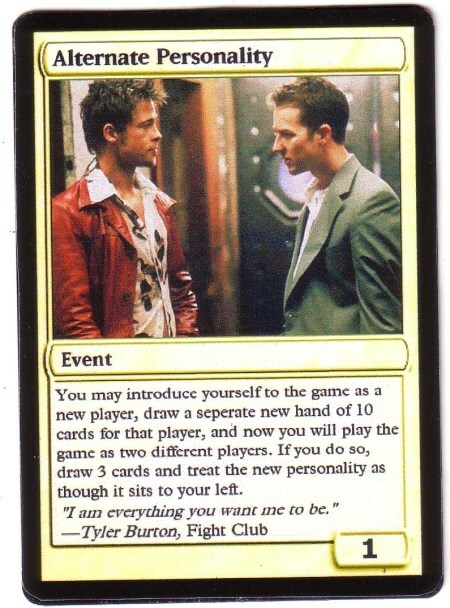 Players take turns playing one card. I had a lot of fun playing the game, but I didn’t like the focus on points. I wanted there to be a different win condition. 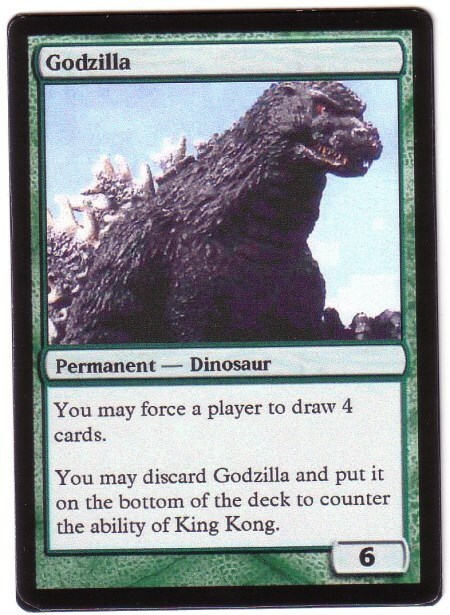 The image used for Alternate Personality is from Fight Club, Godzilla is from one of the Godzilla movies, and the image used for Merchant is by Charles Bargue. The image used for Poker is by C. M. Coolidge and can be found here. 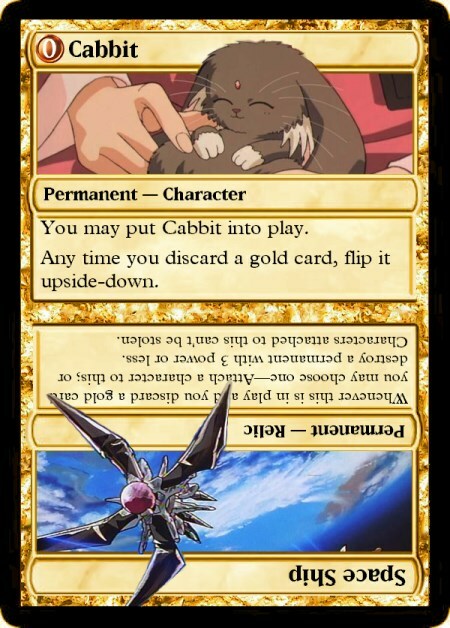 The Cabbit and space ship card art is from Tenchi Muyo. and was inspired by the flip mechanic used in the Kamigawa Magic set, which came out around the same time. I thought of some new ideas for a Nightmare Crazy game. I wanted to simplify the game, I wanted all the ranks and suits used for a regular deck of cards, and I wanted to eliminate a lot of the costs (or all of the costs). I considered using the cards for multiple different card games. I had two different versions of the cards, but I only printed out one of them and it wasn’t as good as I hoped. I should have tried to fix it up, but I was also working on some other game projects at that point. 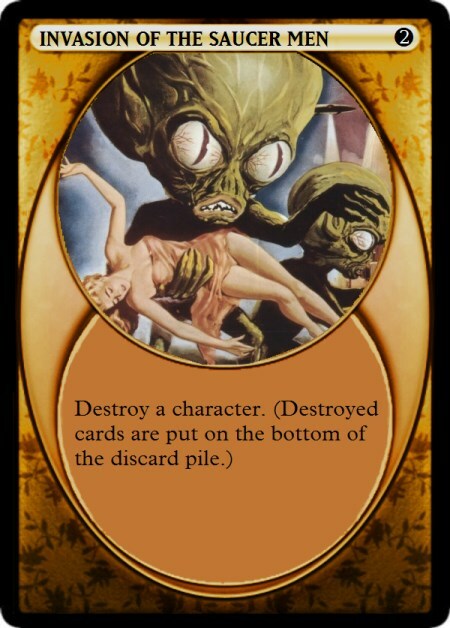 The image used for the card on the right-hand side was from Invasion of the Saucer Men. The card frame is based on a card frame that might have been used for another card game someone was developing. I don’t know if the card game was ever completed or what it was called. 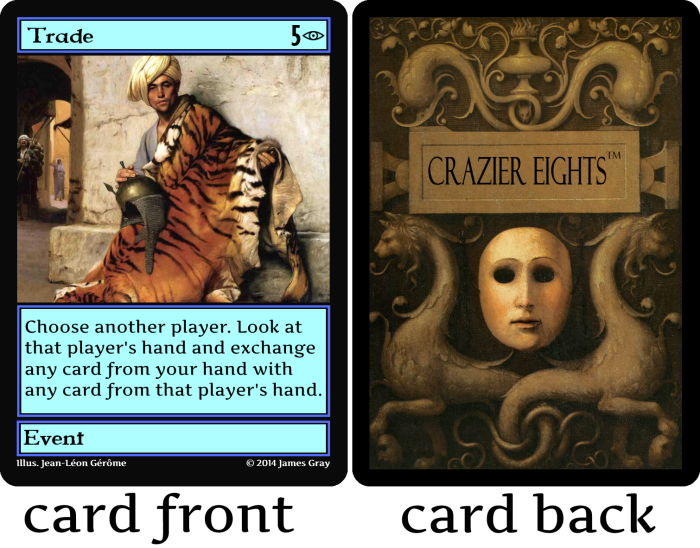 For some reason I was thinking about Nightmare Crazy and I realized that there could be a better way to play the game: Cards could be discarded as usual, but the cards would then have no effect. 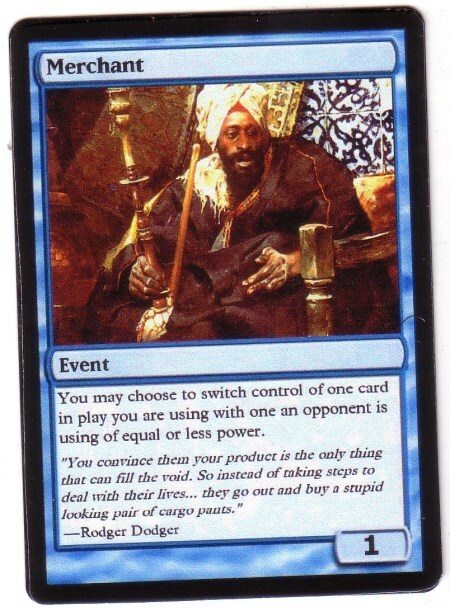 Players would take turns playing any card for an effect and discarding a card (which would still have to have the appropriate color or rank). 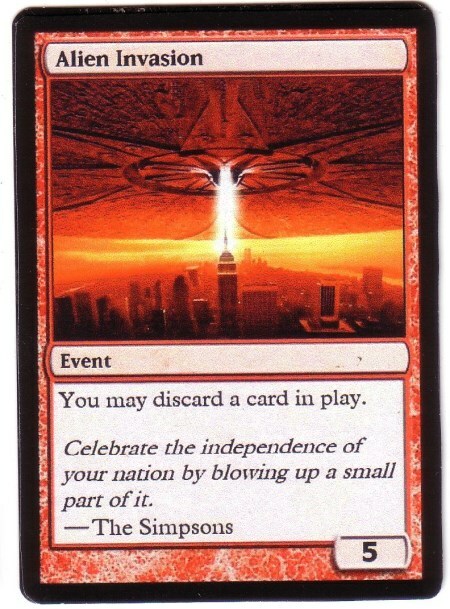 Whenever a card would be played for an effect, the player would draw a card to replace it. I felt like the new rules were a big success. 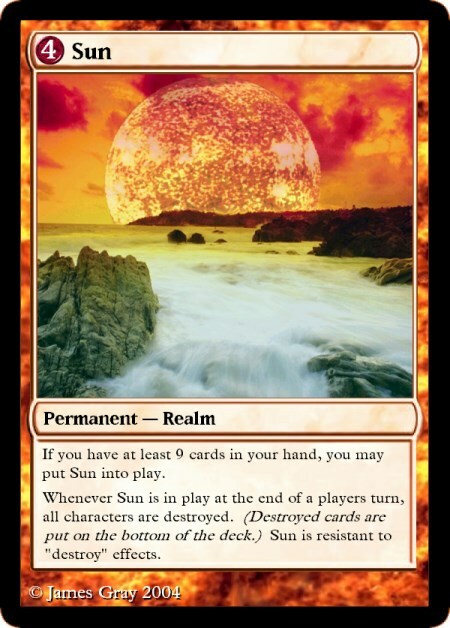 Players could play a card for an effect every turn, and the card effects could be quite strong without leading to any major problems. One issue with the game was that certain cards were a bit confusing. I wanted a card that would make you draw a few cards, then put that many cards back on top of the draw pile, but players had to also remember to draw a card whenever they played a card for an effect. 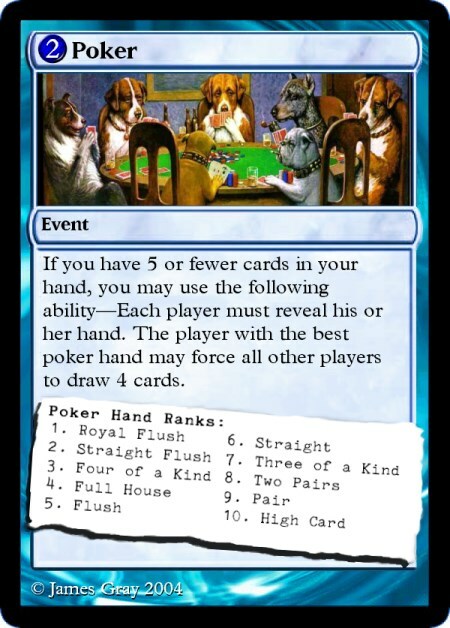 It was some months later that I thought of a better set of rules — players would take turns drawing a card, playing any one card for an effect, and discarding one card. That solved any issues there could be with confusion. Another thing that happened is that I decided that the first version of the game should be quite simple, so there are no costs. Also, the first version of the game has the same cards in every color — There is a blue Trade, a red Trade, a green Trade, a yellow Trade, etc. Now it is June (approximately seven months later), and I have thought of several other ways to improve the game in those several months of playtesting. The story continues. See part 2 here.